Go big with our large picnic baskets, which have enough storage room and accessories for a feasting army--or 5 or 6 of your family members and friends. 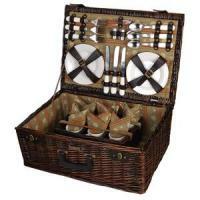 These large picnic baskets range from hand-woven baskets to rolling insulated coolers. Just like our picnic baskets for 4, our large picnic baskets have accessories such as plates, cups, knives, napkins and more. The biggest difference is size. Our large picnic baskets are massive, making them ideal for activities like family reunions and tailgating before the big game. In addition to being a great pick-up for any family outing, they also make affordable birthday gifts for mom, dad, or other loved ones.